Before diving in, this isn’t going to appeal to a broad range of people, but for the few that have a soft spot for novel things, this might somehow make a fine addition to your home. Well, if you also have younger kids in the household, they’ll find the Electric Friends Speaker Docking Station for iPhone particularly entertaining – mainly because it’s disguised as one of four different cutesy looking animals. Priced at $69.99 apiece, it’s definitely one expensive investment for something that’s a speaker system at its core, however, part of its high price tag is attributed to the meticulous design of its cartoony like characters. So without further ado, here’s our hands-on of the Electric Friend Speaker Docking Station for iPhone. 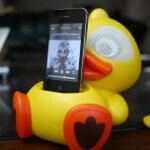 Without a doubt, the lovable and adorable design of the Electric Friends speaker is what makes it stand out a lot. On top of that, it perfectly masks the fact that it’s actually a speaker. So on top of being a great bedside addition to your kids’ room, it doubles as a speaker that can read them books to bed – well, that’s as long as you have some kind of audio book on your iPhone. For some odd reason, it looks as though Kwack Kwack the Duck is staring blatantly at us with its intense eyes. However, hidden behind those bulging eyes are the dock’s two speakers. Constructed out of all plastic, we’re shocked that the speaker feels considerably heavy. Naturally, it’ll stay put in place, but you better hope that it doesn’t fall down to a solid surface because the aftermath can look ugly. Adjusting the volume is accomplished by tapping or holding down the touch sensitive buttons that are placed on the sides of its head. In the rear, there’s an AC jack, power switch, and an auxiliary port – the latter allows other devices to connect with the docking station. Removing the plastic piece on its belly, it reveals the iPhone/iPod docking station that simultaneously charges the device and plays music. Setting it to its loudest volume, there’s some noticeable distortion and crackle, which tends to make the experience irritating. Luckily, putting it to the middle setting allows for some pleasant tones, but it’s still lacking some robust tunes. For kids, they’ll surely appreciate that the speaker dock also boasts a night light of some kind for illuminating their rooms. That's a damn cute little duckie!